NEW YORK, NY, USA – Designers know creativity is a powerful force that transforms and transcends all boundaries. In November 2017, the International Federation of Interior Architects / Designers (IFI), the unique world body for the Interiors profession and a design INGO, will explore how creativity can serve as a vehicle for social and economic transformation through a series of international events in Lagos, Nigeria. 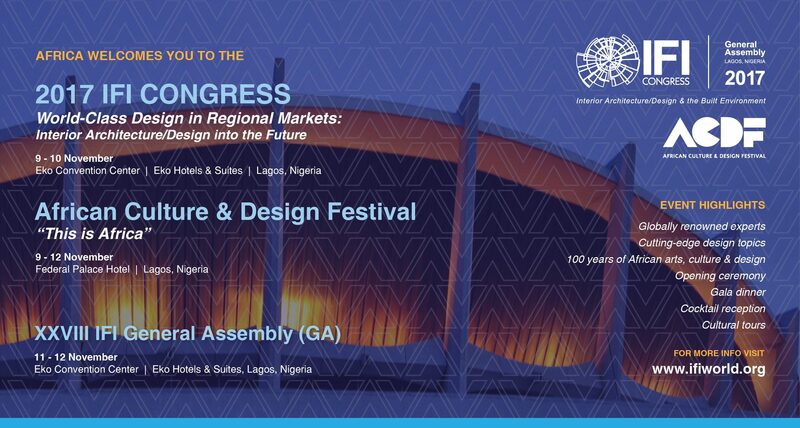 Hosted in partnership with Interior Designers Association of Nigeria (IDAN), the 2017 IFI CONGRESS and African Culture & Design Festival (ACDF) will bring together creative leaders and professionals from all corners of the globe to explore the power and potential of design in developing societies and cultures around the world. Over the course of four days of an art, culture and design festival, as well as a formal day of congress meeting, design professionals and enthusiasts will debate the global social responsibility of the profession and determine the future of design excellence. In conjunction with these events, IFI will host their XXVIII (28th) General Assembly (GA), the biennial business meeting of the 54 year old organization. All events will take place from 9 to 12 November at the Eko Convention Center in Lagos, Nigeria, one of Africa’s most rapidly growing creative cities. To identify how the world’s foremost design experts are using their skills to enhance human health and well-being, leaders from across industries will explore the 2017 IFI CONGRESS theme, World-Class Design in Regional Markets, from various regional and disciplinary perspectives. A morning session will be opened by IFI President 2015-17, Sebastiano Raneri, and will feature keynote speeches from world-renowned architects, artists and designers. An afternoon session for the 2017 IFI CONGRESS will include keynote speeches and panel discussions with African Culture & Design Festival artists and curators: Ms. Ronke Ashaye (Curator of the National Museum in Lagos) and Ms. Bisi Silva (Director of the Centre for Contemporary Art in Lagos; Curatorial Consultant, Bisi Silva Projects). Organized under the theme “This is Africa,” the African Culture & Design Festival (ACDF) is an open exhibition featuring traditional, modern and contemporary African art and design. Titi Ogufere, 2017 IFI CONGRESS and African Culture & Design Festival Director, IDAN Founder and IFI Ex-Officio Executive Committee Member, Ms. Titi Ogufere explains the motivation for organizing the Festival in Africa: “…When we go to international fairs, [other people]…tell us how Africa is,” she notes, “but we want to show the world who we really are. We are thrilled to host this event. We are a young industry and for us, it is a great opportunity to showcase what Africa is.” The ACDF will run from 9 – 12 November 2017. An Opening Ceremony for the 2017 IFI CONGRESS and African Culture & Design Festival will take place on 9 November 2017 at the Federal Palace Hotel Marquee in Lagos. The ceremony will be attended by dignitaries, government officials, keynote speakers and 2017 IFI CONGRESS and African Culture & Design Festival attendees. Additional social events will provide exclusive networking opportunities for participants. These events include a Gala Dinner on the evening of 10 November 2017 and a Cocktail Reception on the evening of 11 November 2017. Social and Cultural Tours of Lagos will also be offered for participants. The XXVIII (28th) IFI General Assembly (GA) is the business meeting of IFI. This biennial event is attended by IFI’s Executive Board, members, external stakeholders and community, to discuss IFI programs and projects, past and future, and plan for initiatives to be undertaken over the new term. The XXVIII IFI GA will take place the afternoon of 11 November and the morning of 12 November 2017 at the Eko Hotel. Registration for the 2017 IFI CONGRESS and African Culture & Design Festival is open to the general public. For media inquiries, please contact programs@ifiworld.org or staff@ifiworld.org. Founded in 1963 as a not-for-profit to expand the international network of professional Interior Architects/Designers, IFI represents close to a quarter million designers, educators and industry stakeholders in the international design community on all continents, collectively representing practicing Interior Architects/Designers worldwide. For more information, visit ifiworld.org. Membership in IDAN indicates status as a qualified, experienced, ethical practicing professional in Interior Design in Nigeria. IDAN provides you with support, networking, services and information to improve your professional practice. It provides you with a wealth of contacts, and connects you with colleagues from many industry areas. IDAN strive to advance the interior design profession and, in the process, to demonstrate and celebrate the power of design to positively change people’s lives.